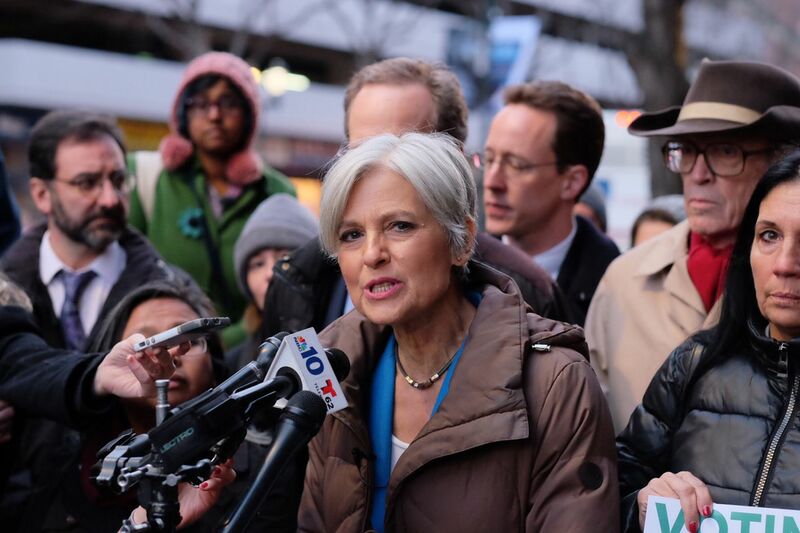 Jill Stein holds a press conference Friday at the federal courthouse in Philadelphia after a hearing on the Green Party’s request for a statewide recount. Green Party presidential candidate Jill Stein "inexcusably waited well past the eleventh hour" in her bid for an election recount, a federal judge ruled Monday in denying her request. U.S. District Judge Paul S. Diamond, in an opinion issued one day before the deadline for Pennsylvania to certify the results of the Nov. 8 general election, wrote that capitulating to Stein's last-minute tactics would mean "all of Pennsylvania's six million voters could be disenfranchised." The Pennsylvania Department of State announced after Diamond's ruling that it had certified the election results. Stein, who has been seeking a variety of reviews for the presidential ballots in some Pennsylvania counties and other states, narrowed her request during a federal court hearing Friday. She sought a hand recount of all paper ballots in one voting precinct in each of 17 Pennsylvania counties that use paper ballots and a forensic review of the computer code that runs the election management systems of six counties, including Philadelphia. Stein built her claims on a theory that the state's election tabulation systems are vulnerable to computer hackers who could change the outcome. But her attorneys and computer experts offered no proof that the systems had been hacked. Diamond, in his ruling, said that Stein's claim "borders on the irrational" and that granting her request could have an "outrageous and completely unnecessary" impact on the state's votes. "Dr. Stein has repeatedly stated that she has sought a Pennsylvania recount to ensure that every vote counts," Diamond wrote. "Granting her later than last minute request for relief, however, could well ensure that no Pennsylvania vote counts." Stein's lawyer, Ilann Maazel, called Diamond's ruling disappointing. "The election regime in Pennsylvania is absurdly burdensome, expensive, and unfair," Maazel said. "Voters who use these antiquated, hackable machines should at least have the right to know that their votes counted." Diamond rejected the hacking claim, writing that Stein "presented no evidence, however, that any such tampering occurred or could occur" while the state "presented compelling evidence that it could not." Stein, in a statement from her campaign Monday, said President Obama on Friday "took the extraordinary step to order a 'full review' of hacking-related activity aimed at disrupting the 2016 presidential election." Hillary Clinton's campaign on Monday called on Obama to disclose what has been discovered about Russian hacking of the Democratic National Committee's computers and her campaign's emails. The hacking of the DNC and Clinton campaign are separate issues from the potential hacking of voting machines raised by Stein. A spokesman for Stein's campaign said she was still considering a potential appeal of Diamond's ruling. Stein's campaign went to federal court after first filing a petition in Commonwealth Court, which then required that she post a $1 million bond to proceed. Stein dropped that effort. Diamond noted that Stein's state court effort was filed on "the last possible day," allowed by law, three weeks after the election. As in her federal filing, the state filing "did not include any allegation that hacking had actually occurred," Diamond wrote. Republican President-elect Donald Trump defeated Clinton in Pennsylvania by just 0.73 percent, a margin of 44,286 votes. Stein, by comparison, won just 0.82 percent, receiving 49,941 votes. Diamond also ruled that Stein lacked the legal standing for her request. "Dr. Stein is not a Pennsylvania voter and does not allege that a recount will change the Pennsylvania vote total in her favor," the judge wrote. In Friday's hearing, dueling computer experts weighed the chances of hacking's impacting the results of the election. An expert called by the state explained that it was "less than implausible to suggest that anyone secretly could hack" the state's voting machines, which are not connected to each other or the internet. An expert called by Stein "knew virtually nothing about Pennsylvania's security procedures, the practices of the commonwealth's election officials, or the Pennsylvania Election Code," Diamond noted. Ultimately, Diamond rejected Stein's claims that the Election Code was unconstitutional in preventing her attempts at a recount. "The right to have one's vote counted does not, however, encompass the right to have one's vote verified through a mandatory statewide recount," Diamond wrote.